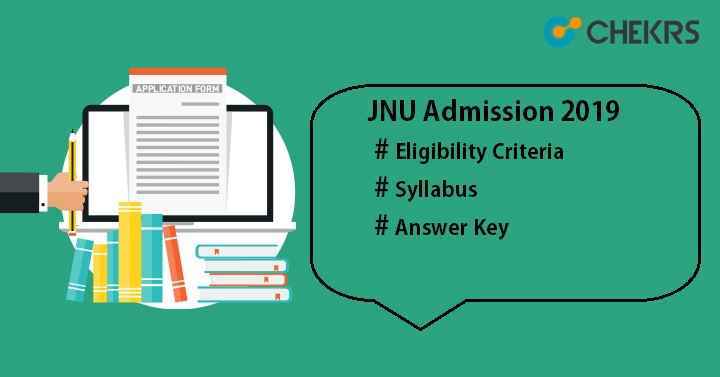 JNU Admission 2019: Jawaharlal Nehru University (JNU), Delhi is a public central university located in New Delhi. This university offers admission into various UG, PG & PhD courses. JNU Admission will be done on the basis of written test‘s results. Latest Update: Last date of JNU Admission 2019 Registration is today (15 April)*. Latest Update: JNU Admission 2019 Notification Released!! Form will be available from 15th of March. Latest Update: For JNU Admission the Entrance exam will be conducted by NTA (National Testing Agency) from 2019 through Online Mode. Latest Update: JNU 2019 MBA Application form has been started. Latest Update: JNU entrance exam will be conducted in May 2019 through online mode. The exam will be conducted by NTA (National Testing Agency) from 2019. JNU organizes entrance tests like JNUEE (Jawaharlal Nehru University Entrance Examination) & CEEB (Combined Entrance Examination for Biotechnology) for admission in the field of science, technology, arts, commerce and etc. JNU Online Form will be available on the official portal of Jawaharlal Nehru University. Candidates going to appear in the entrance test must satisfy the JNU 2019 Eligibility Criteria. No age limit will be there. Candidates have to pass graduation degree to get admission in PG courses. For PhD courses, candidates have to score minimum 55% marks in the qualifying examination. Candidates have to qualify national level written test like JRF for PhD for indirect admission into JNU. Note: To know more about JNU Admission Criteria, Click on this link Check Here. Find and Click on “Online Application for Admission to JNU M.B.A. programme”. Now fill all the required details in the registration form and click on submit. Read the instructions carefully and click on checkbox “I Accept Apply Online”. Fill the registration form and then submit it. After registration, fill the form with all details like academic details, personal details, parents details and contact etc..
Upload photograph & signature in the given size & format only. Pay the application fee and finally submit it. Take the print-out of it for future references. JNU Entrance Exam Pattern will be different for all programmes. Students can prepare themselves for examination according to their courses. The pattern of exam will be different for different courses. Exam will be conducted in offline mode i.e. pen paper mode. MCQ question will be asked in the examination. Question will be asked in 2 parts. Questions will be asked from 12th standard level. JNUEE Paper contains objective type questions. The question paper will be asked from subjects like mathematics, computer science, general questions or aptitude etc. JNU Syllabus will vary according to the courses offered by the university. Candidates who will apply for B.Tech have to follow the syllabus of 11 & 12 prescribed by CBSE. For MA, have to go through the syllabus of BA and similar each courses have different syllabus. JNU conducts annual exam such as JNUEE for admission into all courses and to take admission into biotechnology, CEEB was held. To score maximum marks and get entry in JNU, students must practice previous year papers. JNU Sample Paper will be available on the official site. Candidates can check there and get prepared according to the previous year paper. Previous Year paper will help students to know about the exam pattern, difficulty level of paper, topic-wise weightage etc. Make a time table and follow strictly. Make notes and memorize daily. Take help of reference books and guide also. Take regular breaks between continuous studies. Admit card is very important documents for the examination purpose. It contains the name of candidates, date of examination, examination center etc. It will be mandatory to carry admit card in the examination hall, no one will be allowed to enter the exam hall without admit card. Go to the official website of JNU. Click on the link available there to download the admit card. Enter application no and date of birth. JNUEE Admit card will appear on the screen. Same process will be followed to download CEEB Hall Ticket. JNU Answer Key will be released by JNU official authority on its official portal. Candidates can match their answer with the released answer key and can estimate their score or performance in the exam. Answer key will be published within 4 or 5 days after examinations. Candidates can also object or claim against the wrong answer key with the proof. Final answer key will be updated with the results. Candidates who take JNUEE entrance test and CEEB exam can see their results through online mode. JNUEE 2019 Results will be released in the month of February and CEEB Results will be announced in the month of March. Go to the JNU official portal. Search for the results according to your course. Click on the link “Result of JNUEE 2019” or “CEEB Results 2019”. Enter application no and password and login into the account. JNU Cutoff will be the minimum required percentile or marks obtained by the candidates in the entrance exam. Those who will achieve the cutoff marks will be included in the merit list and they will be eligible for the counselling round. JNU 2019 Merit List will be published in the month of June. After the release of merit list, counselling procedure will be scheduled. Merit list will be prepared on the basis of marks obtained by the candidates. Candidate will be called for interview round after release of merit list. Students who will qualify the interview round will be considered for admission into JNU. JNU provides admission into various UG, PG & PhD courses for the academic session 2019-2020. The admission will proceed after the counselling. JNU Counselling will be done on the basis of merit list published by JNU examination authority. Candidates, whose name will be in the merit list, have to report at the university campus and then register them for the counselling. JNU will provide the facility to opt for the seats or courses. On the basis of their marks & seat availability, seat will be allotted. Interview will be organized for the candidates who opt for the viva-voce programmes. After the result announcement of viva-voice or interview, candidates will be considered for JNU Admission 2019. *Changes in Dates are Possible.